I liked the comedy of the show, with a cross dressing boy and guys finding out that they were hitting on a boy. However, sometimes moments make me feel like it gets a bit to much, or redundant. The people don't get much back story, it doesn't make me feel like I'm getting to know them. Especially the blonde/orange haired girl, I don't remember anything about her past or something like that. Though it's only four minutes long, sometimes I can't stand sitting there for a few seconds witnessing an event during the episode. Isn't it based off of a comic strip related thing or something? I smiled on some occasions, and enjoyed the relationships between everyone but there are things that could improve Himegoto. Alright now, Everyone who wants to give this one star relax, this is a comic relief anime its suppose to relieve tension I don't get why you would grade this anime based poorly its a small side project that actually seems to be entertaining and I recommend it if you want to kill a little bit of time. Himegoto is a 5 minute anime short based off of the hilarious manga and it really does live up to itself! I dont know why so many straight men are so afraid of a pretty cross dressing boy, but if you just relax and give this show a chance you will see just how funny it is! And at 5 minutes an episode, just give it a chance! I watched about only 5 episodes so far and it's been really great. Each episode is 4 minutes long which in my opinion I normally dislike animes that do that, but the pacing is really well done. Just so you know it's from a 4koma manga which explains the short episodes. The plot it self isn't serious and makes for a fun anime when your in the mood for a non serious comedy. "Secret Princess Himegoto Honest Review"
A fresh spin on cliches, and THEN some! 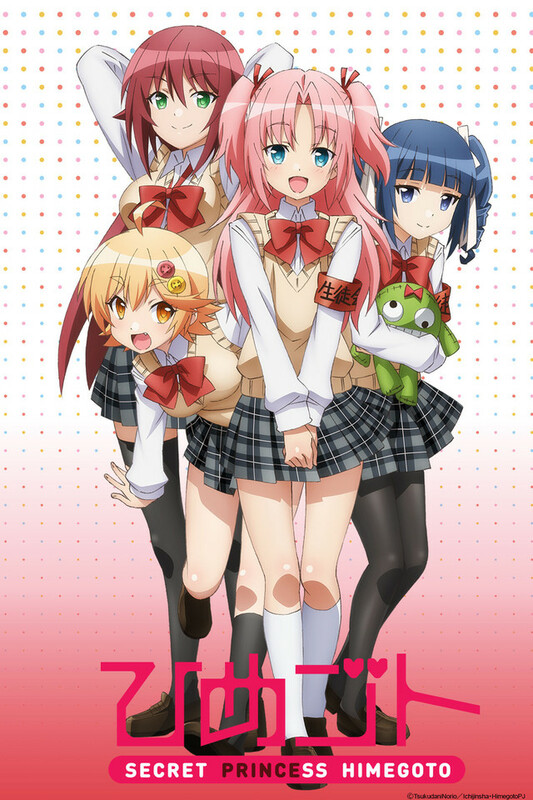 Himegoto, a comical anime about a boy whose peculiar situation dictates he cross-dresses, delivers on every mark I have looked for so far from this type of show. From the the first scene of episode 1 up til the last of episode 3 I always had a smile on my face, if I wasn't already cracking up laughing! Simply by exchanging a heroine for a crossdressing boy provides old gags with new life, ero scenes a comedic overhaul, and storytelling a whole new plain to traverse. Characters, voice-acting, animation, content; This show does all of this and more so well, packing it only into a few short minutes. I know I will definitely be looking forward to future episodes of this show! A quick and silly anime, but very upbeat and cute! As an LGBT person who likes crossdressing as a plot theme, I've seen a lot of the cliches, tropes, and cringey pitfalls...Himegoto manages to use the tropes without feeling hackney, and avoids being completely transmisogynistic! While our main character is confused on how exactly he sees himself, the writing is always positive about his femininity. Despite the basis of the comedy being bulling Hime into doing what they want, the writing also addresses when the Student Council Trio finally take their harassment too far. No, it's not deep and has quick to understand, uncomplex characters; but every role feels well-played (no stock, cardboard characters), and the character design is cute and individual. Himegoto's subtext seems to be thoroughly about enjoying your life and not being ashamed about what you want, because society probably cares less than you think! Funny, intesting, and unique, but a little short. The series as a whole does a great job of giving the characters unique personalities and telling a story in the 4 minute window that they had to do it in. With each episode being so limited, the story is the main focus with a nice layer of humor overall to sate my need for funny, and just a little more than adequate amount of information to keep the story interesting, aside from the interest the premise itself brings. The only real problem* I have with the anime is that fact that it is so short. Given the amount of information and detail that they accomplished in that tiny window, I'd love to see what they could do with 8-10 minutes an episode. A funny, short, and cute series. For those looking for a quick anime title to just unwind from the day and relax for a bit, this would be highly recommended in my book. This is an anime adaption of Norio Tsukudani's first published manga, Himegoto. As you have properly come to realize from the other reviews, comments, and buzz around social media.. the main character of this anime is a cross dresser. He is really cute though~ OwwwwO~~! Hime is required to pay off a debt to the student council at his school and hilarity ensues when they realize he's a guy. They put him in all kinds of situations just to make him feel uncomfortable. The anime is pretty spot on in terms of the adaption from the manga. The episodes are short because the manga chapters are also short. This is basically 4koma (short comic strips). In my opinion, a very good short series that you can just turn off you brain and have a laugh with. Don't try and nit-pick everything, just enjoy it.